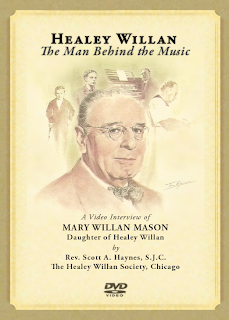 For a couple of months now I have been intending to mention a DVD which has been put out by the Healey Willan Society, Healey Willan: The Man Behind the Music. The DVD in question, which is one hour and twenty minutes in length, presents an interview between Fr. Scott Haynes (of the Canons Regular of St. John Cantius and president of the Healey Willan Society) and the daughter of Healey Willan, Mary Willan Mason. I was very kindly sent a copy of this DVD, and it really is a wonderful interview which gives an inside view of the man and his work. Healey Willan, while certainly known in musical circles, and generally well known within Anglo-Catholic and Anglican circles, is perhaps not yet as well known as he deserves to be generally within Catholic circles in my estimation -- and certainly, with the establishment of the Healey Willan Society and its association with the St. John Cantius, we can hope this will now change. Willan was an outstanding composer of sacred music in both Latin/Greek as well as in hieratic English. In my view, Willan joins the likes of Byrd, Tallis and other English composers in demonstrating that sacred music is not only possible within the context of the English language, but that it can indeed excel within it. Here is a selection from Willan's Missa Brevis no. 5 in F sharp minor as recorded by the choirs of St. Mary Magdalene's church in Toronto, where Willan worked for 49 years. It begins with his moving composition of the Kyrie (in Greek of course) and at the 2:10 mark proceeds into his English composition of the Sanctus. I would certainly encourage people to show your support for the Healey Willan Society in whatever way you can. I would also encourage pastors, choirmasters and choirs who are advocates of Pope Benedict's new liturgical movement, whether it be an OF context or EF context, to consider how they might employ Healey Willan's works within a liturgical context within their own parishes. Within an EF context, his Latin (and Greek) works are certainly something to consider. Within an OF context, an even broader potentiality exists. Finally, it goes without saying that Willan ought surely to be given consideration for the liturgical life of the Ordinariate communities throughout the English speaking world.